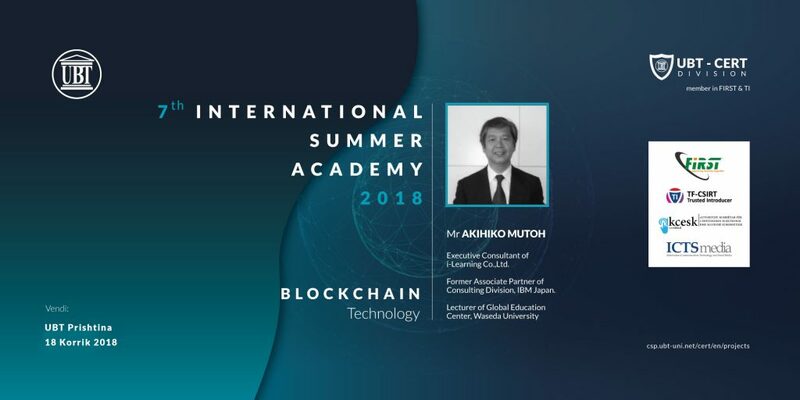 University for Business and Technology UBT & UBT-CERT Division for the 2nd time organize Cyber Security & Privacy International Summer Academy 2018 under the slogan “Security Awareness & Privacy” brings the lecture on Blockchain technology from Japan expert Prof Akihiko Mutoh. This lecture will bring the trends & new information about technology of Blockchain from the place where was born Japan, will be presented about the opportunities which are provided especially in the field of providing online services in the fast & safe way etc. Lecture will be held in UBT Prishtina 18 July at 10:00 AM, after the ending of the lecture students and participants will be visiting the local company ALBVISION where they will introduce to the students the Blockchain ATM.